Explore the Octoraro Creek that borders Black Rock Retreat’s property. 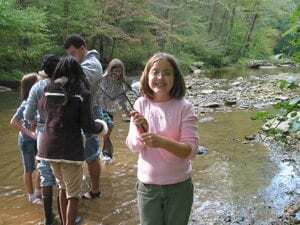 Search for macro-invertebrates and other life that calls this creek home. Of course, there will also be plenty of opportunities to splash through the creek! Cost: $8 per person. Non-participating adults* are free. *The Octoraro Creek is a stocked Trout stream. Anyone over the age of 16 actively participating in this activity must have a valid PA Fishing License (click here to buy one online or to get more info).